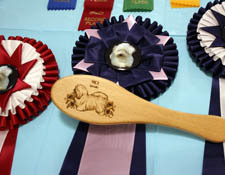 The NACA's first All-Breed Show included 11 Cotons. Shown above competing for BOB are Connie Fox, Sandra Bearden and Julie Renois. Connie Fox visits with Dennis Presley before the show. Pictured on R is Connie's beautiful Lennie. 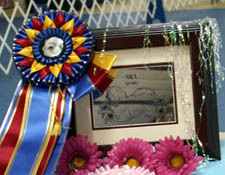 SanDee's Georgia on My Mind, owned by Kellie Bruce, proudly took the BIS Puppy title! Pictured on right is Sandee's Shileigh de Couture, also owned by Kellie. Owner Linda Brookes proudly shows off beautiful SanDee's Griffin who took BOB. Here are some of the prizes for our Specialty in Hutto. Cartoonland's Darjeeling was Best in Specialty winner. He is owned and loved by Sandra & Derrell Bearden. Cartoonland's Darjeeling also won BIS in Show 2 of the UKC Labor Day Show in Hutto! He was shown by 13-year old Junior Handler, Katie Baxter. SanDee's Sugar Coated Sophie took Best Female. Sophie is loved and owned by Julie Morgan. owned by Charlotte and John Cox, being shown in Champion Class.